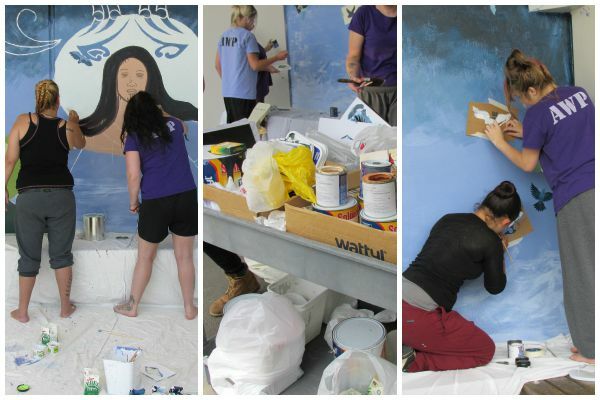 More than 30 women prisoners in the Tizard Unit at Arohata Prison worked together to plan, create and paint a large mural which was completed earlier this year. 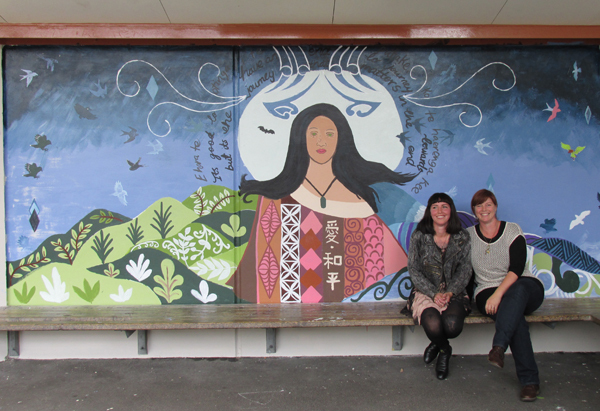 Artist Sarah Hocquard volunteered to facilitate the mural project, supported by Porirua based art teacher Kiri Hiha. The first introductory visit at Arohata Prison took place in early November 2013 and the project was completed with a blessing in February 2015. Sarah participated in her first collaborative arts project in Melbourne after studying Visual Arts at RMIT University and immersed herself in the street art community. “We did a lot of collaborative murals, group shows and I co-organised an art market at our Warehouse 'Antiverse' in Brunswick. It was a very exciting time,” Sarah says. One of the last projects Sarah worked on in Melbourne was The Interlocation Project, which involved fundraising to fly three Indonesian artists from Jojakarta to collaborate with other artist living in the city. 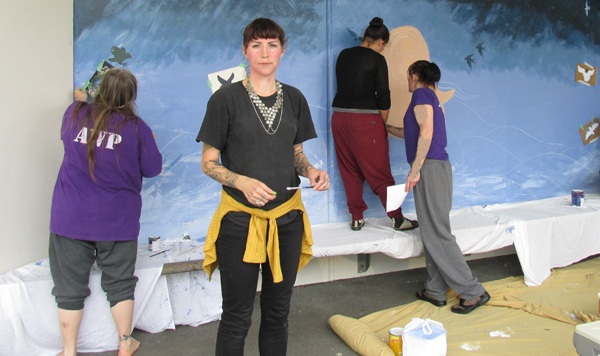 Arriving back in New Zealand in 2013 Sarah saw the relevance of transformed spaces through collaborative art in prison and she approached Jacqui Moyes, Arts in Corrections Advisor, to help her with the mural project. After Sarah approached Jacqui to talk about volunteering her time to manage a mural project, she introduced Sarah to the Prison Manager. Sarah met with then Prison Manager, Ann Abraham, she completed a site visit, submitted a proposal, and completed her Volunteer Application Form. Sarah was looking for someone to work with her on the project, and Porirua based art teacher Kiri Hiha joined the project. 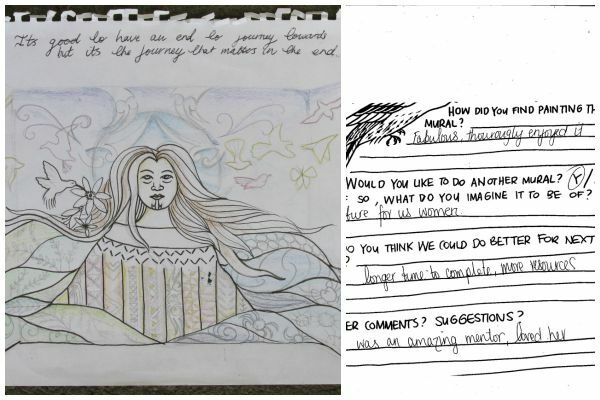 After Sarah and Kiri completed a few planning workshops with the group of women in the unit, and had discussions about what they would like to paint, they drew up a dozen different mural plans. Once the chosen design and necessary equipment was approved by the Prison Manager, the group started painting. The final mural design was a central female figure wearing a cloak inspired by the Korowai. The women painted a different pattern from the various cultures they identified with, within the vertical strips included in the design. Stylized hills depicting various nature elements, represents the flora and fauna the women have a connection to, but are currently separated from. “That really resonated with all the women so the quote became a central part of the mural” Sarah says. Sarah designed a brief evaluation form to gather feedback from the women about their experience of the project. Sarah also requested that photographs were taken by a staff member at the beginning, middle and end of the project to record the development of the mural. Sarah says she found the more involved in the process the women became, and the more they took pride in the mural, they truly committed to finishing it in the short time they had to complete it. Working in a remand unit can be challenging. Something I found really helpful was making sure after every session I set aside time to write down everything that happened. A lot happens in the few hours you are in the prison and it’s really helpful to have something to refer back to later to see what you can improve on next time and reflect on how your sessions went. Another thing that is very important is patience. Expect the project to take longer than anticipated. Expect delays and only commit to doing the project if you can envision still being interested in it even if it does take longer than originally estimated. Original generation time 1.5947 seconds.